1. Soak the rice for about 10 minutes. Boil about 3 cups of water with a tsp of oil and season with salt. Add the rice and, once done, keep aside to cool. 2. Heat oil in a wok. On medium flame, add the chopped garlic, spring onion bulbs, and onions. Sauté until onions appear soft or translucent. 3. Add in all the vegetable and sauté for about 2 – 3 minutes on high flame. Season with half a teaspoon of pepper. 4. Add the soy sauce and schezwan sauce. Stir. You may add a few teaspoons of water if necessary to soften the vegetables. 5. Reduce the flame to minimum and add the rice. 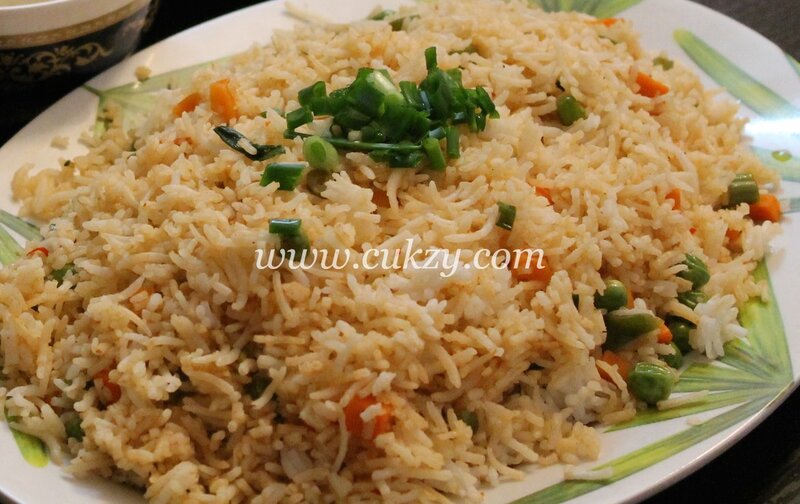 Gently mix the rice so that it is well coated in the sauce. Take care not to break or the grains. Cover and allow to cook for 2 – 3 minutes on low flame.